India’s unique country. Unless you stay holed-up in an expensive hotel, you can’t avoid memorable travel stories. Down every street and around every corner you’ll find something that either knocks your socks off, drives you bonkers, or stops you still with utter confusion. It dawned on me last night, after a particularly harrowing experience, that most of our Indian travel stories involve some craziness in auto rickshaws. So I thought we’d share a few of the adventures that are fit to print. We’d spent almost ten days circumnavigating India. We’d already been to the country’s most Western, Northern and Eastern points (by rail). We were now at its most Southern, called Kanyakumari. Every morning at about 4:30 am, a pilgrimage heads to the Kanyakumari waters to watch the sunrise at the confluence of three significant bodies of water: the Indian Ocean, Bay of Bengal and the Arabian Sea. Like any pilgrimage, the fun starts when everyone decides to head back home at the same time. With almost 20 people in our group, getting taxis was borderline impossible. The ride back to the railway station was about a couple of hours, but due to the crowds, we figured we’d have to downgrade to auto rickshaws. But even that was a lost caused for such a large group. For almost two hours, six of us bumped along South India’s rutted roads. One next to the driver on his single seat, four on the bench seat that comfortably sits two, and me in the small back tray with all of our luggage. It was quite the adventure as busses of locals overtook our struggling rickshaw and beeped and waved with approving smiles. Can you imagine our surprise when our driver stopped short of our destination to tell me to get out of the back in case there were police? Police? Road rules? India? Huh? If we tell this story of six tourists with luggage in a two-seater rickshaw, they look at us unimpressed. It was Lauren’s birthday, and I’d planned a big day of activities in Bangalore. First up were the zoo and safari at Bannerghatta National Park. It would be quite an adventure itself getting there. We’d have to take a rickshaw to the bus terminal, find the right bus, head an hour south to the park, and the walk to the zoo. The bus terminal isn’t huge, but it was super crowded. Getting our bums on that bus was quite an achievement, but not before I lost my cool on the rickshaw ride there. We left our apartment and headed to the main road to flag down a rickshaw. One driver stopped, asked where we were going, agreed to 50 rupees, but then couldn’t get his rickshaw started again. He quickly flagged down another rickshaw, relayed our destination, mentioned the 50 rupees in a mix of the local Kannada language and English, and ordered us to swap. Before getting in, Lauren confirmed that the ride was 50 rupees. We turned up at the bus terminal, and I handed the driver a roll of small notes. He couldn’t see the value of the notes. Even without looking at the notes directly, he said, ‘No, 150 rupees.’ Immediately I thought I would lose it. We’d already been ripped off by rickshaw drivers repeatedly for the past few weeks, but this was the most blatant act. So I said, ‘Fine, I’ll keep the 50’ and then I walked off, towing the birthday girl in my wake. Of course, the driver objected. And with that last word, I gestured with my hand the number zero right in his face. He took the money more out of embarrassment for me than anything else. A passer-by pointed me in the direction of the police station in case there was an issue. But realizing my over-the-top response, I just smiled and followed Lauren into the crowd. We were in India’s far East in a state called Assam. We were far east in Assam too, near the borders of Bangladesh and China. As we walked through the town of Ledo, we felt like extraterrestrial invaders. The locals looked at us with pure confusion. There’s absolutely no reason for tourists to be in Ledo, so they must have wondered what on Earth we were doing in such a remote part of India. I popped into a makeshift barber shop and requested a shave. I hadn’t had one for two weeks, so I was looking a little homeless, even in Ledo. For the equivalent of 40 cents, the barber gave me the full treatment, including a series of slaps across my head, which I suppose constituted a head massage. I felt like a new man after that, even though Steve had fun telling the barber he turned me into a boy. Steve also bought chai for everyone, including the other patrons of the barbershop, and without understanding a word from each other, we thoroughly enjoyed the moment. We walked to the Ledo train station to find a rickshaw to take us both to the rest of the group. We had no idea how far or where exactly they were. When we approached the first rickshaw, he said 700 rupees. ‘What!? Did you say 700?’ He confirmed the 700 and Steve and I looked at each other without a clue what to do. 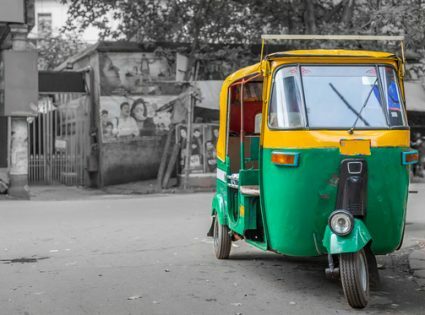 In this part of the country, a samosa is 3 rupees, chai is 4 rupees, an hour-long shave and head massage is 20 rupees, but the rickshaw drivers were asking for 700. They said it was very far away, and we had no choice to take their word for it, but we wondered why the rest of the group traveled so far. Or did they? In the scorching 43 degrees heat of Delhi, our rickshaw broke down and our driver told us to wait while the rickshaw fixed itself. We didn’t believe it but had no other option. Of course, 5 minutes later it started up without so much as a cough or splatter. In a proper taxi in Bangalore, our pre-arranged driver was 45 minutes late. We made the biggest mistake by suggesting Lauren could miss her flight. He drove up to 140km/h in 80 zones, swerving, weaving, and beeping so much that even Indians were displaying road rage. Lauren said it was the scariest moment in her life. In retrospect, we should have told him to stop. On a route I’d taken many times at a cost of 50 rupees, a driver asked me to pay 140 rupees. I asked if that included breakfast and a massage. With a look of pure disgust, he said something in Hindi, probably along the lines of, ‘ marry a cow’. On good days, auto rickshaw adventures are a lot of fun. But the constant attempts to rip you off wears thin. In the coming days, we’ll put together a guide to dealing with dodgy rickshaw drivers. Until then, try not to lose it like I did.